CRYSTAL RECORDS - Stan Kesler started up his own Crystal label with Memphis businessmen Eugene Lucchesi and Drew Canale (Canale owned the National Tobacco Company and Canale Amusement) in 1957. They made some local noise with Jimmy Pritchett's ''That's The Way I Feel'' backed with ''Nothing On My Mind (Crystal 503) and Don Hosea's ''Everlasting Love'' backed with ''I'll Try Again'' (Crystal 501) but, according to the Rob Bowman and Ross Johnson interview of Stan for The Journal of Country Music, the label folded after a few more releases. "Canale put in a thousand dollars and expected back 10,000 next week'', Stan Kesler told them, "...me and Drew wouldn't work''. Kesler went on to say that "In 1959, Clyde and I put in our own studio. We got some semi-pro equipment... we were up on Main Street''. PEN RECORDS - The first Pen Records release was on Bobby Wood's band, The Skylighters, and they would have their first chart action (number 74 on the Hot 100) after the move to Sam Phillips when they leased Wood's version of Kesler composition If I'm A Fool For Loving You (later, of course, famously covered by Elvis at American Sound) to Joy Records in the Summer of 1964. XL RECORDS - For one reason or another, Eugene Lucchesi and Kesler would start up another label named XL around this time. 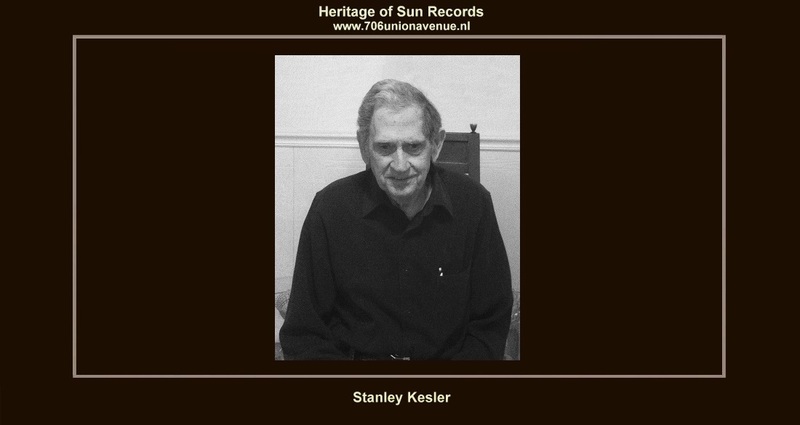 STAN ''STANLEY'' KESLER - Stan Kesler is an American retired musician, record producer and songwriter, whose career began at the Sun Studio in Memphis, Tennessee. Producer Stan Kesler is best known for forming two of the industry's most renowned studio groups, the American Studios Rhythm Section (otherwise known as the 827 Thomas Street Band) and the Dixie Flyers, only to have both groups stolen away. He co-wrote several of Elvis Presley's early recordings including "I'm Left, You're Right, She's Gone" and "I Forgot to Remember to Forget", and played guitar and bass on hit records by Carl Perkins and Jerry Lee Lewis. As a producer, his successful records included "Wooly Bully" by Sam the Sham and the Pharaohs. Born as Stanley Augustus Kesler on August 11, 1928 in Abbeville, Mississippi. He learned to play mandolin and guitar as a child, and steel guitar during his time in the U.S. Marines. After his discharge, he formed a band with his brothers, before joining Al Rodgers in his band, performing in and around Amarillo, Texas. After two years with Rodgers, Kesler moved around 1950 to Memphis, where he played in various country and western swing bands, including the Snearly Ranch Boys led by Clyde Leoppard, who also included Quinton Claunch. Kesler began writing songs for the band to record, and several were taken up by other singers at the Sun studios headed by Sam Phillips. These included Warren Smith, and Elvis Presley, who recorded "I'm Left, You're Right, She's Gone" in 1954, and "I Forgot to Remember to Forget" the following year. Presley's recording of "I'm Left, You're Right, She's Gone", written by Kesler with William E. (Bill) Taylor, was released as a single by Sun Records and reached number 5 on the country chart; his version of "I Forgot to Remember to Forget", written by Kesler with Charlie Feathers, reached number 1 on the country chart in early 1956. By 1955, Kesler had also become a regular session musician at Sun, playing with the house band on records by Carl Perkins and others before switching to bass, which he played on Jerry Lee Lewis' 1957 hit "Great Balls of Fire", and records by Roy Orbison. He also worked as a recording engineer at the Sun Studio. In the late 1950s, he founded his own record label, Crystal, later starting two more labels, Pen and XL. In the mid1960s, he found success with XL, producing "Wooly Bully" and several subsequent hits by Sam the Sham and the Pharaohs. He also worked as a producer with blues musician Willie Cobbs, recording the original version of "You Don't Love Me". Kesler also engineered recording sessions for Quinton Claunch's for Goldwax label, working with soul singer James Carr among others, and in that capacity put together a band of session musicians who included guitarist Reggie Young, drummer Gene Chrisman, keyboardist Bobby Emmons, and bassist Tommy Cogbill. After achieving initial success with Kesler at Goldwax, the band was persuaded to leave to join Chips Moman's new American Sound Studio in Memphis, where they had greater success becoming known as the "Memphis Boys". The group went on to unheralded success, playing on 120 hit records in a three-year period. Kesler then put together a new recording group at the Sounds of Memphis Studio, including guitarist Charlie Freeman, bassist Tommy McClure, keyboardist Jim Dickinson, and drummer, Sammy Creason, until they were able to cut a quality session (they backed Albert Collins on his Grammy-nominated Trash Talkin' album), only to have his studio musicians stolen again, this time by Atlantic head Jerry Wexler. The group, naming themselves the Dixie Flyers, relocated to Miami's Criteria studios, where they went on to record successful albums for Aretha Franklin and Jerry Jeff Walker. When Kesler's third studio group was lured away by music attorney Seymour Rosenberg, the producer finally gave up the notion of independent recording and returned to work as an engineer for Sam Phillips. Kesler eventually gave up the idea of independent production and in 1978 returned to work at the new Sun Studio at Madison Avenue in Memphis as an engineer. He later formed a touring group, the Sun Rhythm Section, with guitarists Paul Burlison and Sonny Burgess, two drummers D. J. Fontana and Jimmy M. Van Eaton, keyboardist Jerry Lee "Smoochie" Smith of the Mar-Keys, and Marcus Van Story. The band toured internationally, and recorded an album on ''Flying Fish Records, Old Time Rock And Roll'' (Flying Fish FF445) in 1987. Stan Kesler is retired from the music industry in the early 1990s, and later lived in Bartlett, Tennessee, close to Memphis.